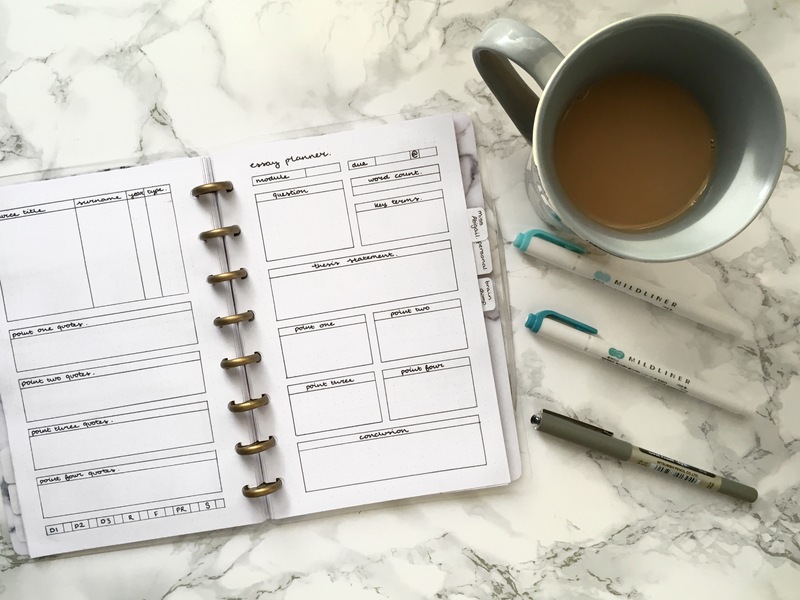 Unfortunately, it’s that time of the year again – time to start thinking about final grades and assignments and all the work you’ve been putting off all semester. 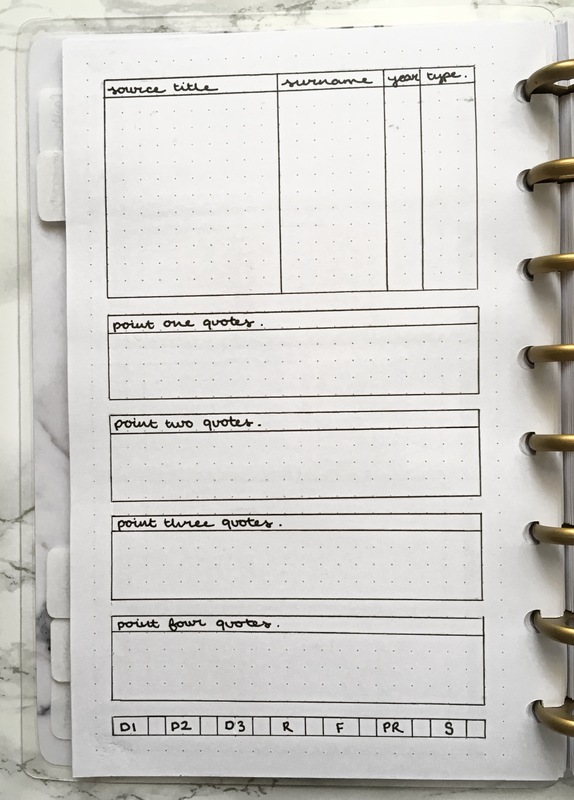 Today, I wanted to share those spreads with you, hopefully it’ll help you out with your next assignment and make the whole exam season seem a little less daunting. If you’re interested, I have this spread available as downloadable stickers on a dot grid background over on my Etsy shop so make sure you check it out if you’re keen! This top section is pretty basic, but if you didn’t have this stuff on hand you wouldn’t get very far with your assignment, would you? The only part of that that I can see presenting any confusion is possibly the whole ‘key terms’ thing. Basically, I look at the question and write down 3/5 words that I’m going to keep referring to throughout my essay in order to make sure I’m sticking to the question and avoiding going off on a total tangent! Normally what I do is to write down four keywords from the question on the left of the box and then pick another way of saying the same thing from the thesaurus, that way I’m not constantly repeating myself! Now, we’re getting into the juicy stuff. This is always the last box I fill in when I’m planning, but it’s the first box I look at when it comes to writing, so it lives here with pride of place. In essence, the thesis statement is a single sentence that sums up your argument in a nutshell. By creating a thesis statement for yourself, you know straight away what your essay needs to focus on and you can check all your paragraphs support that argument and answer your question. It’s a great guide to have to ensure that your essay is coherent and tangent-free. For the sake of this example, and the printables, I’m working on a 4 point essay here, meaning one that’s about 1,000 words in length… ish. 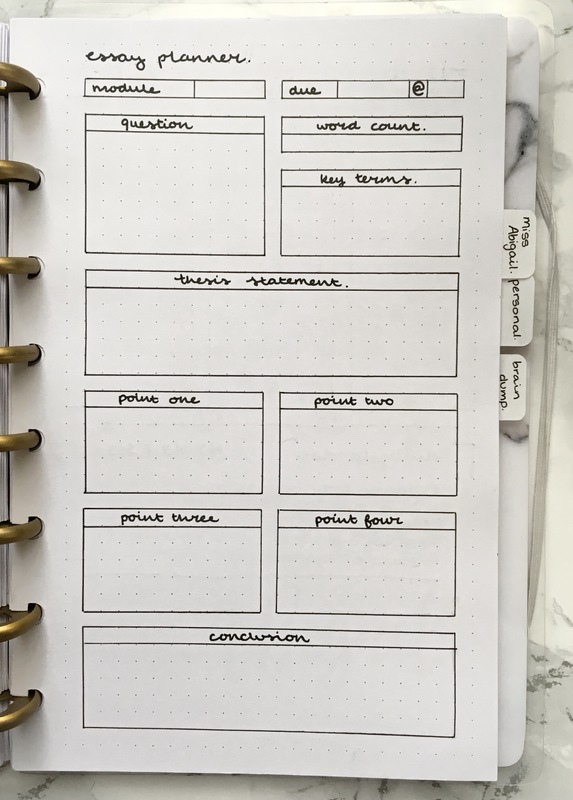 Obviously if it’s a longer essay, I give myself more space to plan and more boxes to plan in, but this does the job as an example. This is a small space where I can lay out the jist of each paragraph. In a comparison question (which a lot of my questions are) I divide these boxes diagonally and write the differences or similarities that I want to discuss on either side of the line. Note: In this section, I don’t write any quotes from texts or critics or give context of anything fancy like that – this is just a quickly few words to remind myself what the point is and to see what arguments I need to research and develop later. Pretty self explanatory, you’ve been writing these since you were in primary school. Mine always ends up looking like my thesis statement and the main body had a baby. Now, we’re into the real work. This is the single most important part of this spread. If I didn’t have this space to record all the sources I want to use, I’d never be able to find them again and my essays would never ever get written. By including the authors surname, the year it was published and the type of source (e.g. a book, article, chapter, website etc.) I can usually find it again fairly quickly and reference it correctly in my bibliography. If you use no other part of this, use the sources table! This is where I really start to flesh out my work and develop the foundation I laid out in the previous page. Here, I write scene references, direct quotes from the text, quotes from critics – anything I can use to back up my argument. Again, sometimes I need more space for this, it depends on the length of the essay and the complexity of what I’m trying to argue, but it’s not an exact science, it’s all down to personal preference (and the size of your writing!). 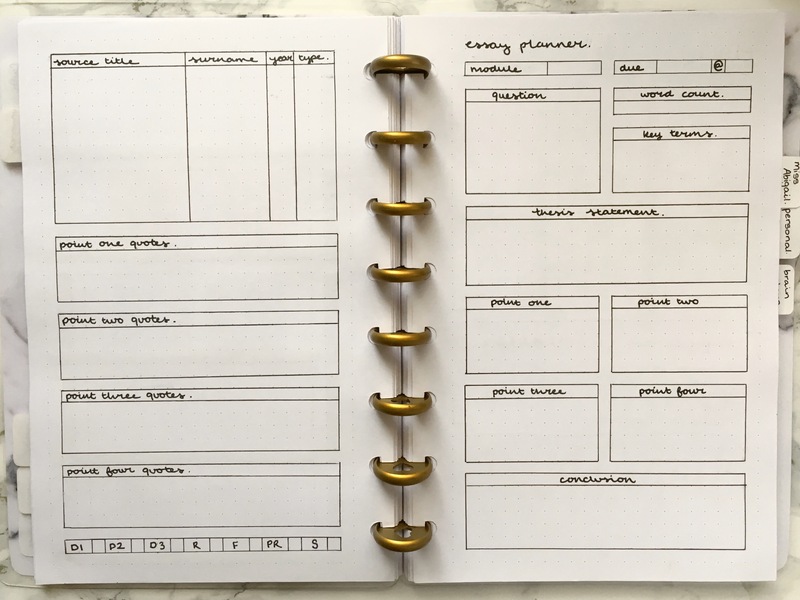 The final part of this planning is something you may recognise from my Assignment Tracker in my Semester Plan With Me way back at the end of August. This way, I know exactly where I’m at and what I have to do to get my assignment in on time. This is the order I like to tackle the assignment in, but if you like to proof read before you format, go for it – you do you! I’m sorry if this is aimed more at university essays an assignments, that’s just where I’m at right now, but hopefully at least some part of it will be useful no matter what stage of education you’re in. Obviously this is not the only place I plan my assignments, but it’s an excellent starting point and a great reference when you come to writing your essay out properly. Let me know how you plan your school work and assignments in the comments down below, I’m always looking for new tips and tricks!